Thanks to Neil Witney for his diligence, patience and imagination. He spent time with my brother and myself looking at pictures, choosing colours and listening to our ideas. He advised and interpreted this into a very meaningful template to create a piece of personalised and bespoke glass art for our Mum and Dad's Golden Wedding Anniversary. We wanted to use impressionist images of buildings from places that are very meaningful to them. Their birthplace represented by Durham Cathedral and the place they have spent the majority of their married life represented by Towcester Town Hall. The initials are theirs, the H being their surname, A's being their first initials of their Christian names. The two hearts represent the love they have for each other and the love of their friends and family past and present. The colour palette is based on the stained glass above the door to the church in which they were married, in Sherburn Village in the county of Durham, now demolished. This also fitted with the Golden theme representing 50 years of happily married life. All these elements are intertwined representing their long lives together. The beauty of the piece is further enhanced by the changing light quality throughout the day and into the evening. Reflecting and refracting the permitting light through the coloured and textured glass. 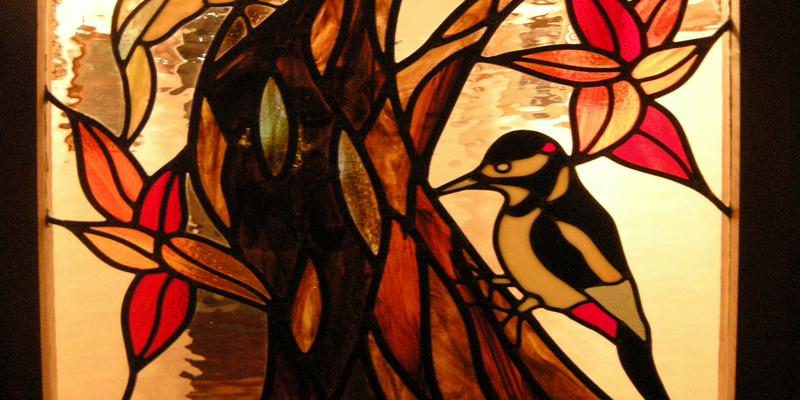 In using iridescent glass for the initials Neil has highlighted the most golden metallic elements within the piece. Our Mum and Dad were blown away by this beautiful, quality piece and it made their day even more special. Once again Neil, sending our heartfelt gratitude. "She is going to put it in her room at the hospital where she runs a clinic for children who have been subjected to abuse. Not only will they find a wonderful woman who will offer them help but they can look at your work and be shown that for all it's darkness, there is light and beauty in the world ." "Hi Neil. I meant what I said your work will give pleasure to people long after we have all gone . The beautiful colours and curves and lines will go on for generations that's an amazing thing to do - to leave the world a better place than you found it - few people do that . In your own way you have helped another human being so thank you Neil." "It has been a pleasure to do business with you - you have the ability to combine a wonderful art form with an efficient, reliable and professional service. 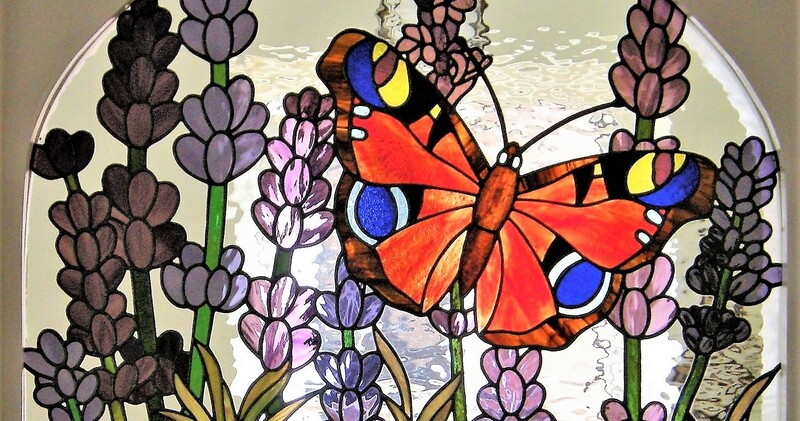 Your stunning stained glass is both spiritual and inspiring and has been an extremely popular part of our catalogue." 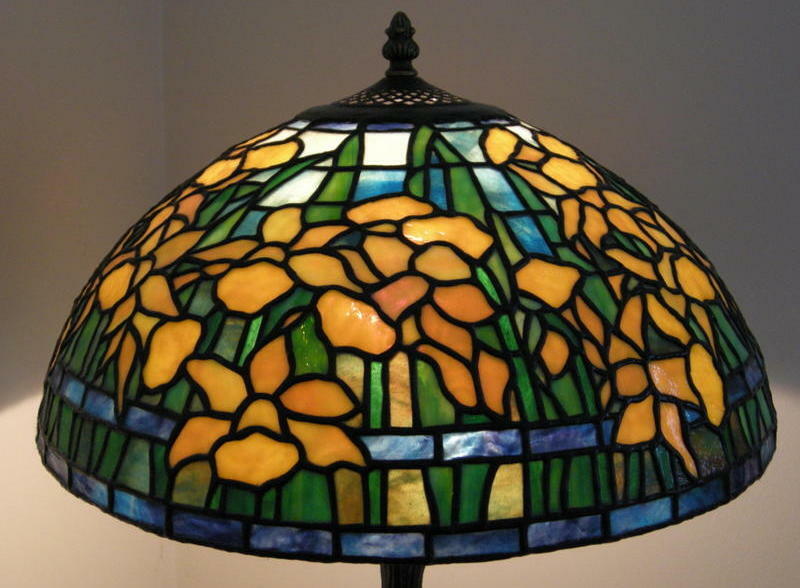 I have just received the Tiffany lamp shades, I am very impressed! They are look fantastic!!. Many thanks for all the time and hard work you put into these, they look fabulous and are a real testament to your skill and craftsmanship!!!!!!! They really are of the highest calibre!!!!!!!!! "Neil, thank you for capturing so wonderfully our family motto..how to make people feel "Ten Feet Tall". I knew I wanted a tree to represent our family, with strong roots and lots of rich green leaves, but my challenge was the love of the colour blue and our motto, which I didn't want displayed obviously. However, it wasn't a challenge to you! I love the way you incorporated "Ten Feet Tall", intertwined with the leaves, which reflects how we live our value day by day....but what has truly blown me away is how you have given me not one tree but two, depending on how the light hits and the time of day. The use of iridescent glass has enabled me to have the pleasure of a blue/green tree and we love it!!"